The purpose of this assessment probe is to elicit students’ ideas about animals. The probe specifically seeks to find out what characteristics students use to determine whether an organism is classified as an animal. You are starting your Unit on taxonomy-what are you needing to know from your students before proceeding very far? This book chapter offers you an answer. It can be used at all levels. I have used it at 6th grade and it helped me to "fix" a few curricular issues that I would not have at first noticed. The chapter explains several levels of understanding that might be encountered and expectations that a teacher might want to address. I’ve used this with my students, as I have with several of the probes from Page Keeley’s books. My 6th graders were completely engaged in this and engaged in some of the most accountable talk they have used in a long time, trying to explain their ideas. It’s fascinating that so many of the kids think that Insects and Humans aren’t animals. Even a couple of weeks later, they are still referencing this discussion. Nice. 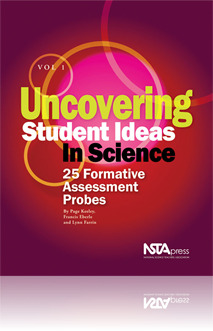 I highly recommend this probe—and others—to get your students thinking and talking. This assessment tool is easy and quick and can be used at the start of a period to generate a discussion about why certain beings are classified as animals and why other things on the list are not. Good start to the classification lesson.